V-LUX is working in the most science-intensive fields and we realize the importance of high qualification of Customers’ employees. Today telecommunication services imply knowledge from most different fields of science and based on this high demand V-LUX has founded a Training Centre "V-LUX". General-theoretical highlights of digital television, CATV networks, data transmission general glimpses and other subjects. Instruction manuals and installation rules of the supplied equipment. 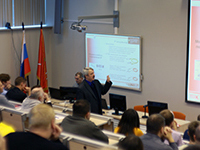 Training on-hands courses organized by V-LUX, ANO NIIPT and Moscow Technical University of Communications and Informatics for technical experts and managers of multi-service operators. The course leavers get the state-recognized degree which is the most prestigious in this field. V-LUX also arranges seminars and training courses abroad at foreign business partner training centers: at manufacturing companies, at networks operators companies, digital video provider and broadband access companies, systems integrators.